Reach your study goals is a ‘Learning to Learn’ resource and is part of our suite of ‘performance boosters’. These are resources designed to help your learners explore their considerable capacity to learn and to help your school implement ‘Learning to Learn’ strategies in practical, hands-on ways. 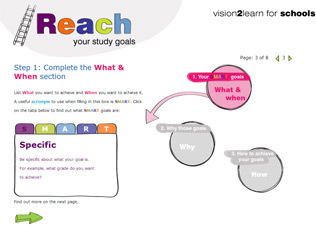 Reach your study goals aims to help pupils set realistic, achievable study goals through a process called Motivation Mapping. By completing this activity, pupils can begin to understand their own motivation about why a goal is important to them. How to set specific SMART goals for what they want to achieve and when they want to achieve it. The real and personal reasons why they want to achieve these goals. Practical ideas about how to achieve their goals. Specific SMART goals for what they want to achieve and when they want to achieve it. Real and personal reasons why they want to achieve these goals. All current learners will find a ‘Learning to Learn’ tab in the navigation bar of their My Study area – Reach your study goals can be found here.